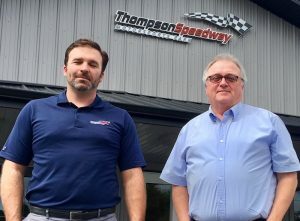 THOMPSON – It’s been the scuttlebutt of the racing scene since talk began of the returning of a road course to Thompson Speedway Motorsports Park in 2012. How long will the oval track remain in business? And for the last six years it seems a topic that so many in the around Northeast racing circles continually question. And with talk of a new management company coming on board, and a new general manager taking over, that question seems once again at the forefront for many. With big changes in the process at the track, Thompson Speedway CEO Jon Hoenig reaffirmed this week that his family is fully invested in their oval track business and NASCAR racing at the facility. On Aug. 14 RaceDayCT revealed exclusively that former New London-Wateford Speedbowl owner Terry Eames would replace Josh Vanada as general manager at Thompson Speedway. This week Hoenig and Eames talked about the plans moving forward. This week the track officially announced a multi-year venue management and food services contract with the venue management company Spectra. The track has been working on corporate partnership sales with Spectra since May. “We’re just trying to create a place that accommodates everything so we can always survive the changes,” Hoenig told RaceDayCT. Hoenig said the venue management deal with Spectra will do little in changing the operation of the oval track. Hoenig also stressed that his family, which has operated the facility since its inception in 1940, remains in control. “The way that these deals work is that we’re a client to them really,” Hoenig said. “We’re the owners. It’s really just adding a robust layer of management to help grow the place. We’re not handing them the keys and telling them ‘Go run the track.’ They’re working for us. We hired Terry and we also hired them. It’s to build out our programs better, it’s build out our hospitality events better and it’s to create better events – stronger events – and grow into a bigger company. It’s not going to have any effect on our motorsports program. It’s only going to have positive effects. Eames spent more than 20 years at the Speedbowl, first as a consultant working for the track, later as a general manager and then as the track owner. He owned the facility from 2000 to 2014. Current Speedbowl owner Bruce Bemer acquired the facility as high bidder during a foreclosure auction of the property on Oct. 18, 2014. Eames officially began his duties as general manager of Thompson on Sept. 4. He oversaw his first event as general manager on Sunday. The big question for many is how the changes will effect the oval track schedule? Thompson Speedway went from a traditional weekly type schedule to a shortened seven event schedule in 2014. The track is running a seven-event schedule in 2018. Eames said has hopes to see that schedule possibly grow to 10 events soon. “It’s about maximizing our profitability with the venue,” Eames said. “For years I kept track of the numbers at Waterford about how many times a racer shows up per event. … The number that sticks in my head of an overall average was 11 or 12 times, the average number of appearances per driver. So why design an 18, 22, 24 race schedule when you’ve got a marketplace that only wants to show up 10-12 times? Say hello to $9 beers and $10 hamburgers. I loved the Thursday night weekly racing. Don’t go to the tour races because they cost more money and they finish to late for a work night. Weekly racing would usually end at 9:15-9:30 which was perfect. Spectra used to manage the MassMutual Center in Springfield and still manage the XL Center in Hartford, and the prices aren’t bad. They also have concession promos like reusable drink cups that you can refill at half price. It will be interesting to see what they do at Thompson. I have been to a few minor league hockey games in Springfield and thought the prices were reasonable. If they come in with a minor league pricing format, I think they have a great chance of success. It never made much sense to me that you could go to a cup race for less than a tour race at Thompson. Bad move. It will fail. These MBA’s are idiots but their well connected. Bad move. It will fail. I don’t see why any change is needed with the concessions. Unless the prices are going down which I doubt. Do most Thompson drivers want to race only seven times a year? I doubt that too. It’s why many of them race at multiple tracks. As far as the fans. I wonder if they would rather pay over 40 bucks for the few events. I like the regular shows for a reasonable price. Run more WMT races. Keep the present 4 that they have and add 3 more to the schedule. That’s the only series that brings in the fans. Reduce the admission and they will come. Change the format to 2-75 lap events and invert the 2nd 75 lap main for the WMT. Make it fun for everyone and if Terry is so great he should be able to land some big sponsors for the WMT races. Could any of the NASCAR series like Trucks , Xfinity, or the Cup series come to the road course? That’s what usually happens ! Will this affect the restuarant or just the track vendors ? Look at the Hartford baseball team. Anybody that has kids and has attended a game. It’s a beautiful stadium, fun stuff going on, bounce house area, for kids, you could go and hang out without even following the game. I say this because you need those type of people spending their money there so the real fans have a track to follow the sport. Thompson is already the high caliber stadium and presentation. Definitely need to lower prices to get in the door. And to get the next generation of fans there needs to be a division that has imports. Chip technology whatever teens-young adults grew up with “fast and the furious”. They have never seen a 4 cylinder mustang on the road, or a 85 Montecarlo! Is that back when Jimmy Carter was president. Get a division that has imports maybe even street legal. The ones street racing organize them into a division to run with the current format. And bring back free camping.